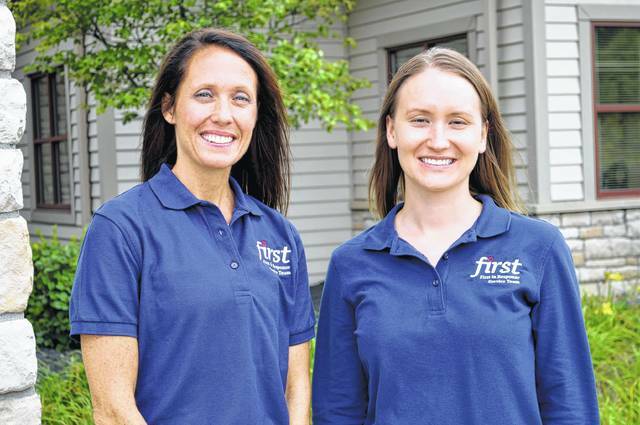 SourcePoint’s service coordinators Angie Lucas, left, and Emily Stockton, right, are working in collaboration with the Delaware’s fire and police departments, and code enforcement to expand the FIRST service coordination program to all residents in the city of Delaware. SourcePoint in collaboration with the city of Delaware recently expanded the eligibility and reach of the FIRST (First in Response Service Team) service coordination program to all Delaware residents in a pilot project. What began in 2013 to connect older adults who contacted the Delaware Fire Department to additional community resources via SourcePoint’s trained service coordinators now is available to anyone living in Delaware, regardless of age, who is referred by one of the city departments, including fire, police, or code enforcement, according to Fara Waugh, director of client services at SourcePoint. Following a 911 call or a report from a city department, a service coordinator will reach out to an individual to assess their needs and connect them to appropriate resources. The FIRST program helps to reduce the number of calls and runs by first responders and works with the person to ensure their health, safety, and sanitation needs are being met. The FIRST Program is Delaware now has two part-time service coordinators, according to Waugh. Emily Stockton will provide service coordination services to ages 55 and up; and Angie Lucas will be dedicated to individuals ages 54 and under. Both service coordinators work for SourcePoint, but are located at Delaware Fire Department’s Station 303 at Lexington Glen. Funding for the program comes from a variety of sources, she said. For older adults, FIRST is funded by a grant from the Central Ohio Area Agency on Aging, as well as by levy receipts and private donations. For those younger than 55 years old, the city of Delaware is contracting with SourcePoint to provide service coordination. Stockton has worked for SourcePoint for more than three years. Before joining the FIRST program, Stockton was a Care Consultant for our In-Home Care Services and then moved to the service coordinator position in July 2017. She now serves as a liaison with community agencies, networks with community providers and seeks out new services available to the older adults aged 55 and over in the city of Delaware. Stockton receives referrals from first responders and city employees in an effort to assist individuals in need of additional support and reduce the amount of non-emergency 911 calls. Lucas came to SourcePoint with a strong work history in social service delivery and advocacy. Lucas provides service coordination to residents age 54 and under. She serves as an advocate for community members in need and a liaison with community agencies for those she serves. She works closely with the Delaware City employees and first responders to identify residents in need of additional support. Lucas links individuals to available resources with the goal to get them appropriate support so they are not reliant on calling 911 for non-emergency situations. She works with Delaware City Police as a part of its Rapid Engagement Team, and then monitors community referrals to ensure services provide ongoing support to meet residents’ diverse needs.